No. 3: Cambodia will get China fatigue: As one of the poorest countries in Southeast Asia, Cambodia desperately needs investment. In the past several years it has welcomed investment from China, with $5.3 billion flowing into the country since 2013. Late last year, China penned 19 new development deals with Hun Sen, right after Chinese companies invested $7 billion in the country. Cambodia needs to develop its infrastructure and part of Beijing’s investment will pay for a new highway to connect Phnom Penh to the port city of Sihanoukville. However, Cambodia’s growing reliance on China (in addition to a rebuke of the West) has created an unstable political and economic environment. For example, in Sihanoukville, Chinese casinos dot the local landscape. As a major hub for China’s Belt and Road Initiative (BRI), it has seen an influx of both casino cash and foreign arrivals. Locals report that the cost of housing has increased, sometimes pricing out Cambodians or forcing many low-income people to move to the edges of the city in search of affordable housing. Along the Meklong River, the need for hydroelectric power, critics say, is washing away local livelihoods. Other countries have already felt the effects. A breach in a dam along the Lao border with Cambodia killed 26 people, but more than 140,000 people in the area depend on the river for their livelihoods. One report in May warned that a proposed hydroelectric dam near Sambor along the Meklong could “literally kill” the river due to its impact on wildlife. 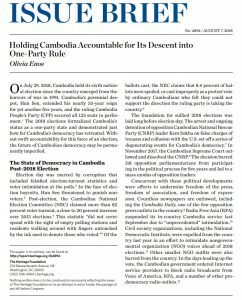 A direct consequence of Cambodia’s lack of transparency, accountability or proper governance in managing the BRI could be political and social instability–not created by political divisions–but by social and economic inequality and environmental mismanagement. Hun Sen has shown an unwillingness to place good governance above short-term ties with China, a decision that could have devastating consequences. The ‘privatisation of urbanisation’ in Phnom Penh, supported by Chinese foreign direct investment, is almost exclusively aimed at the Cambodian upper class and at Chinese tourists and businessmen. While few of the large real estate projects in Phnom Penh provide exact figures on the nationality of their tenants, it is estimated that about 90 per cent of units are sold to Chinese citizens. This drives the city’s housing prices up to the point where the units are unaffordable for most Cambodians. The luxurious, Western-style design of many of the Chinese-built apartments is also out of sync with traditional Cambodian architecture and can be unappealing even to middle- and upper-class Cambodians. As a result, Chinese real estate development projects in Phnom Penh frequently do not integrate with the broader urban fabric and instead form satellite cities within the capital that are largely disconnected from their wider surroundings. The construction of these projects also often requires the displacement of previous residents and the infilling of lakes, to the detriment of the existing urban infrastructure. Another concern is the true intentions behind Chinese real estate investments in Cambodia. Observers note that more than half of the luxury apartments and condominiums in Phnom Penh bought by Chinese nationals are paid for in cash. This could suggest that the acquisition of such properties is a front for money laundering by wealthy Chinese citizens who are worried about their home country’s mounting debts and unpredictable authorities. Being primarily a cash economy, Cambodia has lax internal banking controls and few enforced policies against money laundering. This would be an appealing environment to any wealthy Chinese businessperson who wants to usher their excess money out of reach of the Chinese government, which has been targeting corruption on an unprecedented scale in recent years. This means Chinese investment in the Phnom Penh real estate market is unlikely to be sensitive to Cambodian demand. The growing housing bubble in Phnom Penh could very well result in an oversupply of empty, overpriced condos in the capital while much of the Cambodian urban population remains locked out of the housing market. Real estate development should become the responsibility mainly of the public rather than the private sector, as the primary concern of real estate development should be the provision of decent housing, including and especially to low-income and poor city dwellers. It is essential that the Cambodian authorities who are concerned with urban planning introduce policy planning and implementation processes that can prevent Phnom Penh from becoming caught in a pattern of unsustainable growth. Hun Sen received a scare in Cambodia’s 2013 general elections, when the Cambodia National Rescue Party (CNRP) made an alarmingly strong showing. After it did so again in last summer’s local elections, the party was dissolved on charges it tried to overthrow the government with help from the United States. In recent years Hun Sen has moved heavily into China’s orbit, receiving its financial support while bending rules for Chinese businesses—including through controversial land concessions—and backing Beijing (paywall) on issues such as the South China Sea on the world stage. 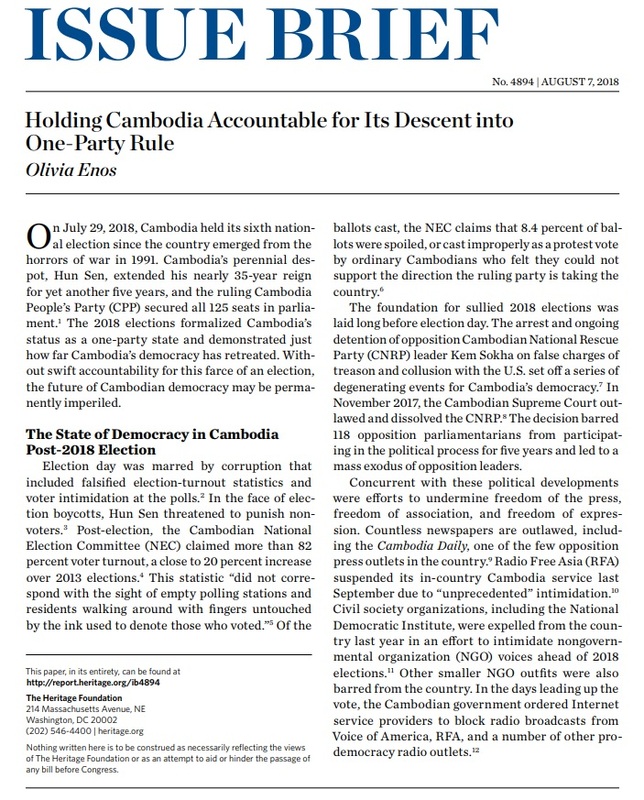 Many now see Cambodia as a client state of China, and Beijing, of course, has no problem with autocratic rule. “It is beneficial to China when its clients are weak, undemocratic, and where rule of law is not implacable,” noted CNRP deputy president Mu Sochua, who lives in exile for fear of arrest.